The meniscus is a pad of cartilage between the femur and tibia that acts like a shock absorber to protect the knee. It is also vital for knee stability. There are two menisci in each knee joint: the medial meniscus, which is on the inside part of your knee, and the lateral meniscus, located on the outer half of the knee. When the meniscus is damaged or is surgically removed, the knee joint can become loose or unstable. Without the protection and stability of a healthy meniscus, the surfaces of the knee can suffer wear and tear, leading to a condition called osteoarthritis. Meniscus tears are extremely common knee injuries and can occur in any age group. At one time, surgeons would remove part, or even all, of an injured meniscus. Today’s surgeons, however, understand just how important the meniscus is to the long-term health of the knee. This is why more focus is put on repairing the tear when possible. To repair the torn meniscus, the surgeon inserts the arthroscope to view it. In some cases, only a partial meniscectomy is needed. This means that the orthopedic surgeon will remove the torn portion of the meniscus. If a bigger repair is needed, however, surgeons will use sutures to sew the torn edges of the meniscus together. Others may use special fasteners, called suture anchors, to anchor the torn edges together. Most tears of the meniscus do not heal on their own. A small tear in the outer rim (the red zone) has a good chance of healing. However, tears in the inner part of the meniscus often require surgery. 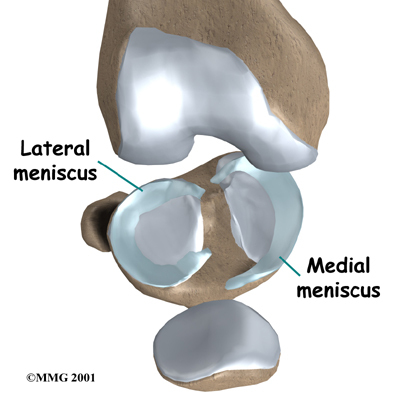 The overall goal of the surgeon is to save the meniscus. Preserving the nearby areas of the meniscus is vital for keeping the knee healthy.